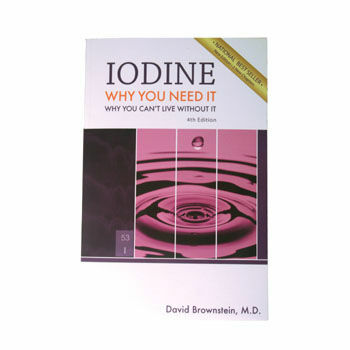 Dr. Brownstein's famous iodine book: the 2009 4th edition with 259 pages. I began my interest in iodine over 12 years ago. Michigan, my home state, resides in the Goiter Belt of the United States, where the soil is deficient in iodine. Although I suspected iodine deficiency in many of my patients, my initial uses of potassium iodide gave suboptimal results. Some patients did improve, but many did not notice any appreciable improvement. When I started using the correct form and amount of iodine, I started to see clinical results. With the advent of iodized salt, iodine deficiency was thought to be a thing of the past. That is not true. Iodine deficiency is occurring at near epidemic rates. This article will review the consequences of iodine deficiency. Four years ago, I began testing my patients with the Iodine Loading Test (FFP Labs, 877 999 5556). Although I expected lowered body iodine levels, I was not ready for the magnitude of the results. After testing over 4,000 patients, over 95% of those tested showed deficiency on laboratory testing for inorganic iodine. When physiologic doses of iodine/iodide were added to their regimen, many of these patients showed dramatic improvement in their condition.